How to get a Legendary Skill? First, your hero must reach level 90 with Orange promotion, farm and craft the "special gear" of your hero to open a series of legendary quests specific to that hero. Upon completion, the hero will be transformed into a Legendary hero with a new Legendary skill and fancy visual effects. - The Originals: Heroes with the medal (The Originals) can get HP enhancement (+3960 HP). - The Originals: Admiral, Emberstar, Leaves Shadow, Lightning Master, and Chaplain. - ????? : Marks an enemy for 7 seconds (refreshes per attack including US). Marked enemies get additional 630 damage from Bear Warrior's attacks (stackable, maximum of 5 times). - The Axe Power: Heroes with the medal (Axe Gang) can get Strength enhancement (+180 Strength). - Axe Gang: Brute, Death Bringer (ucool changed it), Dwarf Warrior, Iron Hoof, Lightning Master, Tusked Storm, and Vanguard Warrior. - ????? : Divine Light (GS) also increases the Armor of the target by 270 for 20 seconds. - ????? : Commander enhances all friendly female heroes' maximum health by 3600. - ????? : Demon heroes get additional 180 armor. - Demon Type: Death Bringer, Fallen Dominion, Ferryman, and Succubus. - Phantom Dodge: Dodges incoming attacks and then creates a phantom to help fight (max 1 Lvl 90 phantom, lasts 15 seconds). - ????? : Adds 1 Flame Chain (GS) to Ember Blade's Blazing Blades (PS). Deals a burning damage up to 2160, guaranteed hit against below Lvl 90. - Electromagnetic Field: When Arrec dies, his lightning element is spread to all enemies causing causing them to lose (540) energy. - ????? : Giant heroes get additional 180 magic resist. - Giant: Mountain, Ancient Protector, Death Bringer, Psychopath, and Shallows Keeper. - Big Bang: Bokka masters another mini skill (of US) that deals less damage (990 damage) but costs no energy at all. - Naga Protection: Heroes with the medal (Naga Race) can get Agility enhancement (+180 Agility). - Naga Race: Savage One, Depths Voice, Shallows Keeper (uCool didn't include him?) and Vengeance Spirit. - Armored Shell: Every time 15% of the max HP is taken, Shallows Keeper will create a thick shell that removes negative buffs and temporarily increases his armor (by 180). - ????? : Summons a skeleton warrior from the bodies of dead heroes. - ????? : Sword wielding heroes get additional 180 physical crit. 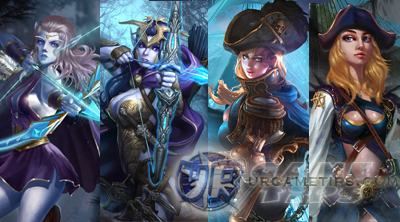 - Swordsmanship: Swordmaster, Admiral, Death Knight, Depth's Voice, Ember Blade, and War Chief. - ????? : Deals 1350 damage to all enemies upon death. - ????? : Beast heroes get additional 180 strength. - Beast: Warrior Monk, Bear Warrior, Deathgore, "Mech Racoon" (unofficial name), and Vanguard Warrior. - ????? : Int female allies get additional 90 spell penetration (ignore magic resistance stat). - Int Female Type: Deathmage, Chaplain, Emberstar, Frost Mage, Ice Mage, Master Mage, Succubus, and Wind Master. - ????? : Summoned allies and illusions get additional HP. - Flame Cleave: Eva's normal attack deals extra burning damage (up to 2160 cumulative DoT. - Ice Barrier: Right before Ice Mage is killed, she can protect the weakest ally by an Ice Shield (absorbs up to 6300 damage). - Energy Leak: Keld causes the silenced enemies to lose energy over time. - ????? : Lodot's Power Strike (BS) also absorbs 270 energy and reduces the target's magic resistance by 45. - ????? : Fiera recovers her teammates' energy by 450 upon death. - ????? : Whenever an allied hero dies, Saif gains 270 Intelligence from the dead hero until the battle ends. - ????? : Tala charms all male heroes, reducing their damages by 15.3 %. - ????? : For every 10% decrease in HP, All troll type heroes gain 10% increased attack speed. - Troll Race: Wandering Spearman, Shadow Shaman, Tusked Storm, and Wizard Doctor. - Sacrifice: Apollo does self destruction and deals massive magic damage nearby when he reaches 10% of his max HP or dies. - Sanctity: Heroes with the symbol (Pilgrim) can get extra (72) magic resistance. - Pilgrims: Mystic, Cloudwalker, Deathgore, and Soulhunter (uCool replaced Swordmaster). - ????? : Mechanical engineered heroes get additional 27% attack speed. - Machinery Type: Pilot, Machinist, "Mech Racoon" (unofficial name), Rifleman, and Sniper. - ????? : Flying heroes get additional magic attack. - Flier: Poisoned One, Griffin, Master Mage, Old Curse, Phoenix, Corrupted Angel and Pilot. - ????? : Devours an enemy summon, upgrading his armor and magic resistance by 90 (stackable!). - ????? : Perrin significantly increases his critical stat by 270. - Wind Hunt: Heroes with the symbol (Archery) can get accuracy bonus (+45 Hit). - Archery: Wind Master, Commando, Shadowleaf, Professional Killer, and Vengeance Spirit. - Admiral, Psychopath, Ice Mage, Wind Master and Brute. - Savage One, Depths Voice, Mystic, Lightning Elemental and Emberstar. - Light Bringer, Ice Spirit, Bear Warrior, Imperial Executioner, Succubus, Shallows Keeper and Swordmaster. - I still need confirmations for the below series so I will leave them here. - Soulhunter, Death Knight, Deathmage, Frost Mage, Necromancer, Professional Killer, and War Chief. - Dragon Knight (unofficial name), Old Curse, Poisoned One. - Coming Soon, hero is still unavailable in HC. - Ancient Protector, Deathgore and Fallen Dominion. - Still unknown which hero has this effect.